This page is for volunteers working with me at children’s triathlons. 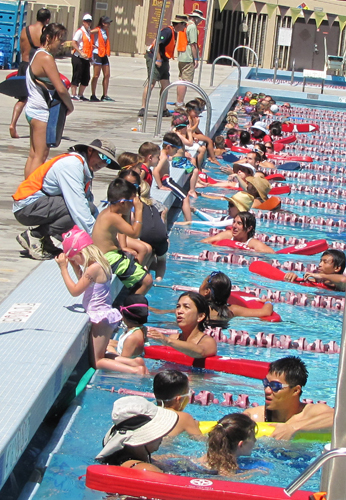 It is mostly photos from Silicon Valley Kids Triathlons, which my lifeguard graduates and I guarded for ten years, but includes tips/stories from other children’s tris. 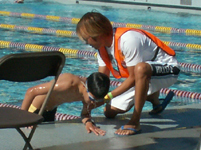 Todays Kid’s Triathlon was amazing! We did amazing work and it was an adrenaline rush all the way through. Thank you for preparing us so well. Everybody was ready to rescue and we all knew what we were doing and looked good while at it. Typically 1,000 kids ages 15 to about 3 swim in, for example, 22 waves (groups by age), one start every ten minutes, starting at 8 a.m. with the last wave after 11 a.m.. 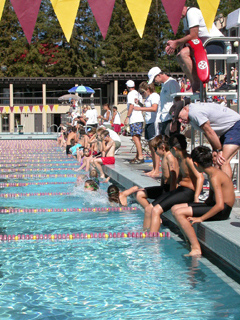 The oldest swim 200 yards, most swim 100 yards and the youngest swim 25 yards (across the width of the De Anza olympic sized pool). Every ten minutes a group of very loudly cheering parents/relatives/friends fills one side of the pool-side bleachers. 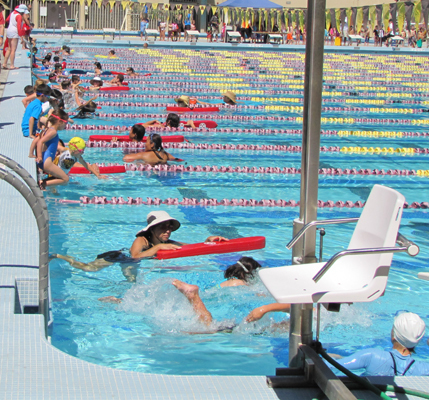 Each wave of kids meet first in the bleachers on the other side of the pool, then as their race start time comes up, are escorted down to the pool, some hopping along the way. A few younger girls hold each others’ hands. Triathletes often have their race numbers on their upper arms and their age on their calves. Two of these triathletes had the number 3 on their lower legs. 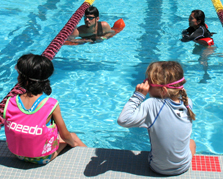 Next the kids sit on the side of the pool. About one minute before their start they slide into the pool. They listen to the crowd shout down the seconds 10, 9, 8, 7, 6, 5, 4, 3, 2, 1… hear a blast on the start horn, and swim. some with great strokes and flip turns, some with a modified doggie paddle. One year we watched a child holding a kickboard, kicking and pulling the lane line with one hand for propulsion. And each athlete is encouraged to WALK please!, (not run), along the poolside and up the stairs to the parking lot where their bike is parked. 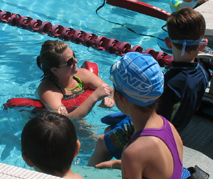 Why/when do the lifeguards get into the pool at a kids tri? 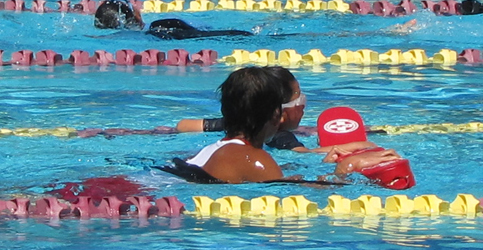 Many of the kids have competitor-class strokes. 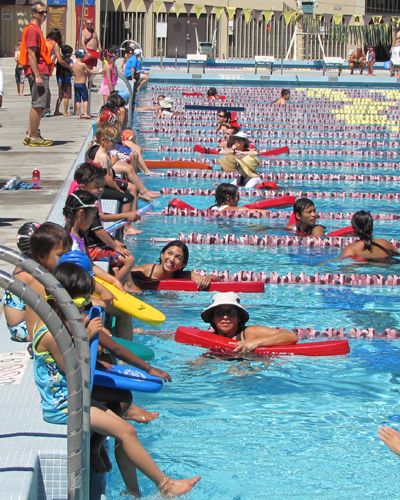 If we were guarding a recreational swim instead of a race, we would have pulled kids whose strokes were weak and told them they should not be trying to swim such a great distance. 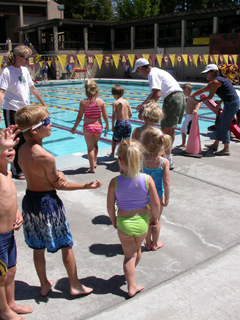 At a kid’s tri a couple of decades ago at a different pool, we were volunteer guards and the pool lifeguard staff was being paid. 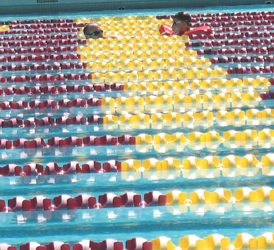 They pulled each kid who had any trouble swimming; we wanted to swim next to them so they could finish the race. 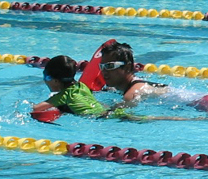 Occasionally a swimmer either waves for help or grabs a lane line and a lifeguard goes in to assist. 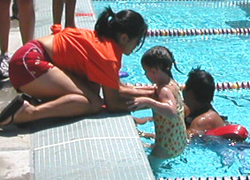 In the first case of a swimmer needing extra help one year, a girl swam to a lane line and raised her hand, the prearranged signal that she wanted help. As I swam up to her I said “if I swim next to you the whole way could you finish the swim?” She agreed and we finished her second 50 together with my rescue tube where she could easily grab it if needed. Most of the lifeguards and some other adult volunteers get in the water with the last waves of swimmers, ages six and under. 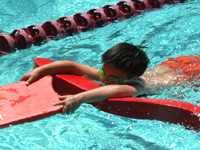 If the race allows such devices, any child holding a kickboard or trying to use a noodle for support is not a great swimmer, and may be hesitant and need closer watching. 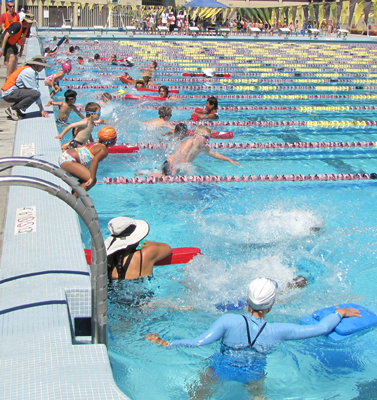 In a 2004 race Alan jumped in as he watched a doggie paddler go from swimmer to distressed victim to active drowning victim in under five seconds. The boy was paddling well, then stopped kicking and his legs sank. Finally he was dog paddling vertically, not making any forward progress and unable to reach the laneline only inches away. The young man in question, the parents and spectators might not have known he needed help, but a trained lifeguard does. In 2013 a father swam next to his 4 year old son, who was holding a kickboard. The kickboard slipped out from his hands, the son grabbed the father around the neck and incapacitated him and a lifeguard had to rescue both of them at once.